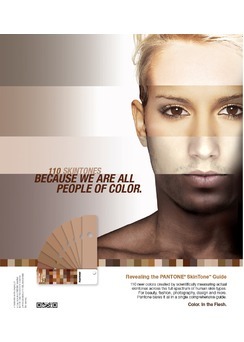 The PANTONE SkinTone Guide was created by scientifically measuring thousands of actual skin tones across the full spectrum of human skin types. 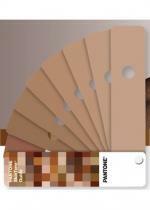 Specially formulated to be the closest physical representations of skin colors, the library is a comprehensive visual reference of human skin tones for use in any market where skin colors are relevant. It's the only internationally available color standard to accurately match skin tones. Each PANTONE SkinTone number is comprised of a four-digit alphanumeric number. The first two positions reflect the hue or undertone of the skin. The second two positions represent the tone or lightness and darkness of the skin. • 110 colors numbered from 1Y01 SP to 4R15 SP. • Each color is identified by a unique PANTONE Number that represents both the tone and the undertone of the color. • Large-size swatch with central aperture for easy color evaluation and matching. • Reverse of swatch has mock perforation to allow color to be shared. • Includes complimentary access to PANTONE COLOR MANAGER Software upon registration. Digital values available. • Colors were developed to present the best color match when evaluated under D65 (Daylight 6500K) lighting. • Compatible with today's digital workflows â€“ colors easily updated in leading design applications. • BEAUTY: Matching and coordinating cosmetics to skin color. • FASHION: Bring skin color into the mix when developing colors and palettes for design and producing accessories, foundation garments and intimates. • PRODUCT DESIGN: Develop and control natural skin tones for toys and a variety of products and accessories. • PHOTOGRAPHY: Easily match skin tones for accurate photo editing and retouching. • PRINTING/PACKAGING/GRAPHIC DESIGN: Provides quality control standards for consistent and appealing skin tone reproduction. • MEDICAL: Useful for creating baseline color standards for restorative and cosmetic surgery and prosthesis manufacture.